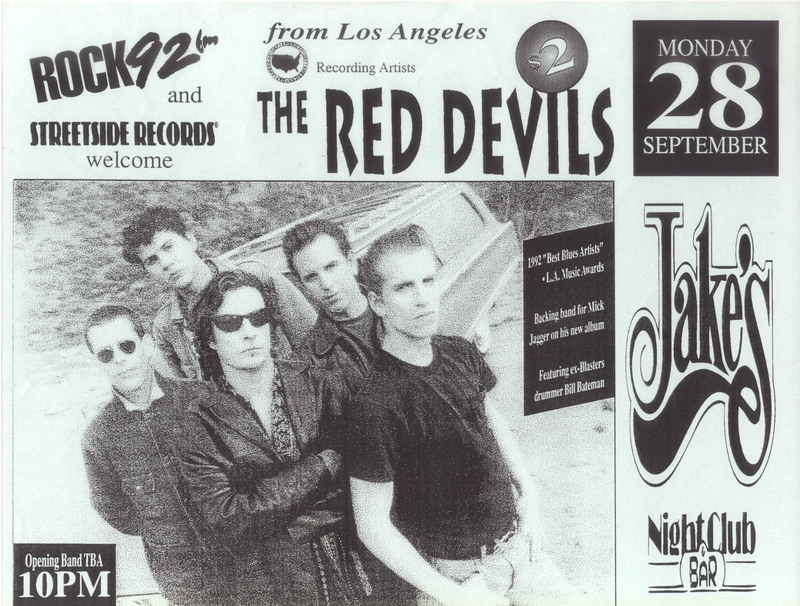 We’ve covered The Red Devils’ October 1992 gig in Bloomington, Ind., extensively on No Fightin’. But here is yet another advance, a really good interview with Lester Butler by the Indianapolis Star. The Red Devils have been invited to open for the Allman Brothers, Little Feat, Dixie Dregs and Los Lobos. They’re so hot (and so good) that Mick Jagger invited them to play on his forthcoming solo album. With Jagger singing, they recorded 14 songs in 12 hours, all covers of blues tunes by Muddy Waters, Slim Harpo, Little Walter and others. Butler doesn’t know how many of the songs, if any, will end up on Jagger’s record, which is due out in November. But he felt honored to record with one of his childhood heroes. The 32-year-old Butler grew up in Los Angeles listening to the Allman Brothers, Rolling Stones, Aerosmith, Led Zeppelin and blues. Influenced by Paul Butterfield and John Mayall, he started playing harmonica at an early age. Although Butler describes himself as “the ultimate Spicoli,” a reference to the Sean Penn druggie/surfer character in the movie Fast Times at Ridgemont High, he has concentrated on music. “I’ve studied my music since I was a small child and I’ve lived through some incredible, intense experiences,” he says. “I almost died. During the ’80s, the reason I didn’t play music was I was severely addicted to heroin and cocaine. I had to learn to get off that, you know? Opening band: The Chosen Few. This entry was posted on July 7, 2011 at 11:36 pm and is filed under red devils with tags bloomington, jake's, king king, lester butler, red devils. You can follow any responses to this entry through the RSS 2.0 feed. You can leave a response, or trackback from your own site.